In 1990, when we were living in Frankfurt, I received the phone call that changed our Thanksgiving celebration forever. The call was from my friend, Pat, who had just won a turkey, which was the prize for a 5K road race. What am I going to do with this turkey, she asked? It’s enormous! We quickly decided that the only thing to do with an enormous turkey was to cook it and invite everyone we knew to a real American Thanksgiving. As we had the much larger apartment, we held the event at our place. I should add that Pat and I knew a heck of a lot of people. That first Thanksgiving was a “succes fou”. The food may have been traditional but the guests definitely were not. Instead of the Norman Rockwell family pictured above, we had an exotic assortment of international mutts: homesick Americans, international Germans and lots of other nationalities drawn to Frankfurt during that ‘moment’ in the 1990s when the city was vying to become the financial capital of Europe and the American military had an enormous presence. The meal was big fun and completely chaotic. We had invited so many people that we ran out of everything, chairs, knives, plates but no one seemed to mind. That enormous turkey was the talk of the town. The next year, we did it again. We invited more people. We gave people assignments and extended the menu. We developed traditions. 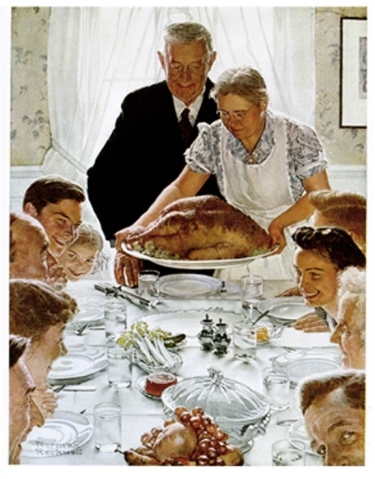 Your father started reading Art Buchwald’s ‘Explaining Thanksgiving to the French’. For some reason that I can’t remember anymore, I started to wear an Austrian dirndl. Our Thanksgiving became like the baseball field in the movie ‘Field of Dreams’. We built it and they came. And then we moved to London – and still they came. And they keep coming. But of course, you know all of this. You were there. Buy a big turkey. Invite everyone you know. Cook. Eat. Next year – repeat! Advice isn't always a bad thing. When I was living in Paris (1991-92, or thereabouts), I decided that Thanksgiving had to be celebrated, and I invited about 25 friends to stop by my place on the Rue de la Cerisae. I found cranberry sauce and pumpkin pies and sweet potatoes and ordered an enormous turkey from a pleasantly bewildered butcher just off the Place des Vosges. The one thing I hadn't bothered to check was the oven. I used the stove to make coffee and tea and eggs and pasta and such, but I'd never used the oven. It simply hadn't occurred to me to make a roast. It was only on Thanksgiving morning that I discovered that gas wasn't hooked up to the oven. It was a startling discovery.